Description: A truly unique formula that contains 6 expeller-pressed essential oils in one soft gel. 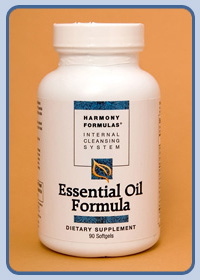 This potent and powerful formula contains Flax Seed Oil, Black Currant Seed Oil, Pumpkin Seed Oil, Safflower Oil, Lethicin (which is high in essential fatty acids and is also a powerful fat emulsifier), and Natural Vitamin E. The oils are 100% vegetarian and are pressed at temperatures no higher than 110 degrees. Ingredients: 1000 mg blend of: Flax seed oil, Black currant oil, Lecithin, Pumpkin Seed oil, Safflower Seed Oil, Vitamin E.
Benefits: These essential fatty acids are necessary for the development of certain hormones and enzymes. They nourish the skin, hair, mucous membranes, nerves, thyroid, adrenals and cells. They aid functions such as blood coagulation, blood pressure normal- ization, and cholesterol reduction. Additionally, these EFAs keep the gastrointestinal tract lubricated which aids in smooth, efficient digestion and elimination.